King Kronos herald from Germany and can be loosely categorised as stoner rock, though they cover broader musical ground on Soundzilla. They are a five piece band featuring a female vocalist and a twin guitar attack that sets them apart from the more compact riffage of Acid King, the easiest band to directly compare them with. Be warned however, one false click on the internet will bring you face to face with a ginger-dreaded rapper operating out of the American Midwest under the same title! A cursory first listen to Soundzilla brings you up to speed with King Kronos’ modus operandi with Kyuss-style fuzz guitars dominating the proceedings. 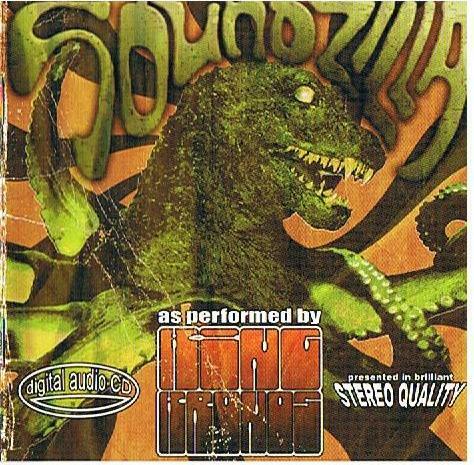 Straight out the gate the opening track, (The Rising of the Awesome) Soundzilla, opens with a downtuned Eagles of Death Metal sleaze swagger that builds into the same charging rhinos drive that notably propelled the aforementioned Kyuss during their heyday. However it soon becomes noticeable that whilst the guitars are heavy, the instrumentation in general is quite muted and attenuated with even the cymbals sounding dull and restrained. The album credits state that it was recorded in a studio called “Die Lobby”, which is perhaps a nod towards the overall dry acoustic of the record, sounding largely like the band jamming together in a small room. The mix works in King Kronos’ favour for two notable reasons. Firstly the listener isn’t left with the aural fatigue that more cavernous, punchy and aggressively mixed stoner albums tend to employ. Secondly King Kronos’s female vocalist, Stephanie Koch, is given far more sonic space and whilst her vocals are often layered with effects they are never obscured or pushed into the background, instead floating over the background layers of sludgy guitars. Furthermore, any additional instrumentation, featuring on a fair number of the eleven tracks, really sparkles against the fuzz backdrop. Musically the band explores a greater territory than can be commonly attributed to stoner rock bands, a genre which is already showing signs of advanced atrophication in some areas. Instead of relying on slightly tired runs up and down various blues scales, the band uses some interesting dynamic contrasts and musical passages to keep the listener interested. Track five, the B movie homage The Love Blob, notably ends with a zither part played in unison with the churning guitar riffs. Furthermore the crude oscillating electronics on Alehouse Rock are reminiscent of the DIY electronics heard on Faust’s debut album. Elsewhere sparse use of both an ocarina and a driving piano line, a la The Velvet Underground’s White Light/White Heat, again add an extra dimension to the music whilst interesting mixing techniques, such as distorted drums, give each track a unique thumbprint away from the ‘theme and variations’ feel of some stoner releases. The lyrics themselves also look beyond the typically misanthropic and down-on-my-luck lyrics of stoner rock. Tracks pay homage to Transformers characters and dodgy ’50s B movies, clearly a personal preference for the band. Rock to Whom Rock Is Due lampoons posers and the perennial fear, in rock circles, of selling out (whilst mentioning anti-dandruff shampoo). In general the lyrics have a slightly too simple narrative quality that highlights, or betrays, King Kronos’ German origins. Furthermore the lyrics seem at times rather clumsy, with too many words crammed in, jeopardising the effectiveness of Koch’s pared down Ozzy-esque vocal melodies. The biggest limitation of Soundzilla is that at times the music indicates that an almost academic study of previous stoner rock releases has been carried out. The use of audio samples from B movies is a too-often used gimmick that isn’t used with any great weight here. The track Ultima Thule is also perhaps also too formulaically following the great rock tradition of putting one “Set the Controls for the Heart of Planet Caravan” lighter song on the album to demonstrate the band’s quieter side. However the band do show that they are looking beyond the typical conventions and are perhaps indicating a more direct link with their European identity that may become more abundant in further releases. Watch this space.